Fitness Doctors – The Fitness Doctors,Inc. 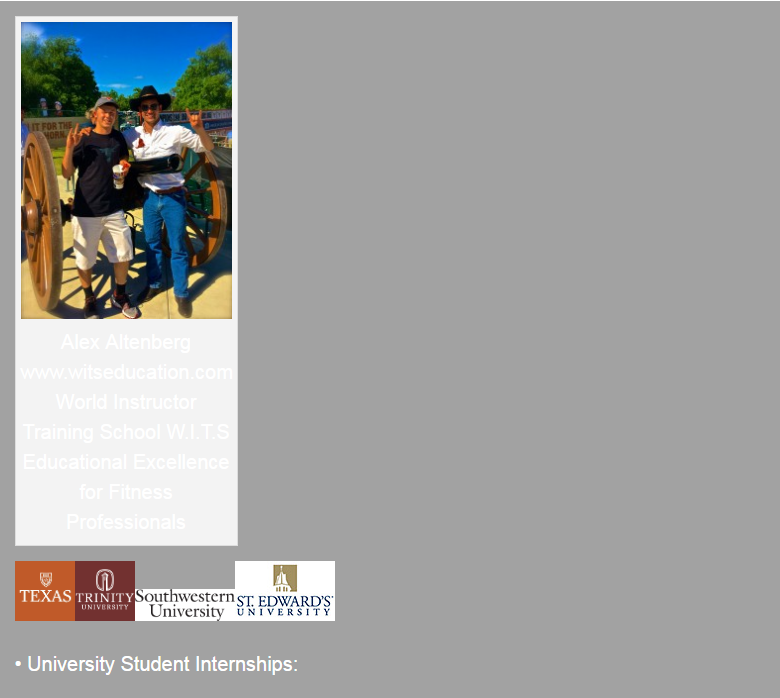 located in Austin, Texas, has internships available for fall, spring, & summer semesters for qualified undergraduate or graduate students in Exercise Science, Physiology, Kinesiology, Physical Therapy, Premed, Fitness, Strength Conditioning or related fields. Fitness Doctors is an integrative health & fitness center specializing in general Health & Fitness, Medical Exercise, Post Surgical Rehabilitation, Cardiac Rehabilitation, Disease Management, Pilates, Physical Therapy and Sport Specific Conditioning, as well as, injury prevention programs. Fitness Doctors is the first sports training and conditioning corporation of its kind in Texas. Fitness Doctors addresses a unique void in the healthclub — healthcare marketplace by establishing partnerships with other entrepreneurial allied healthcare providers. An internship at Fitness Doctors will provide a dynamic, learning environment which will assist you in gaining experience in many areas of the private club industry. The parameters of an individual’s internship will be established based on his/her interests, needs and qualifications. No stipend or housing accommodations are offered for internships. Visit our website, https://fitnessdoctors.com/, to learn more about our history, services and programs. To apply email Sarah@FitnessDoctors.com! Be sure and include your specific interests and internship requirements in the letter.